Many of us worry about how we’re going to survive financially in our retirement years – but imagine trying to get by without any sort of pensions or benefits. Our team are here to help you get the support you’re entitled to. Here’s Ken’s moving story and how we were able to help him at a difficult moment of his life. Watch the video below or read on for Ken's story. When Ken lost his brother Tony, his world was left shattered. Although Tony had been ill for a while, his death came as a complete shock. Ken explained how they’d lived together their whole lives, trying to manage their finances on their own. They simply didn’t realise the support they were entitled to. Nigel, one of our Financial Inclusion Officers, stepped in to help Ken. He did some digging, spending hours on the phone to various people and making sure Ken received the benefits he was entitled to. 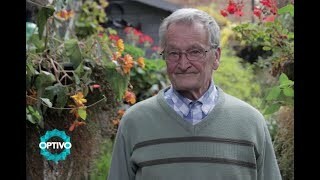 Nigel helped set Ken up with housing benefits, as well as a State Pension and Pension Credits. Ken added: “I think I would have just got to the point where there would have been no money left and then that would’ve been it for me. I’m part of a particular generation who never thought about asking for financial help. But having had this happen to me, I urge anyone in the same position to speak out. Do you want to speak to someone about your finances? Find out how we can help here. Grants and schemes you may be eligible for. Contact us today to find out how we can help - simply use the form below to get started. You can also contact us in a number of other ways to find out more information about how we can help.